While researching for the upcoming season of Fantasy Football, I have spent a lot of time pondering who will be the best six defenders, or eight midfielders at season’s end. While daydreaming about my theoretical finished team, I got on to thinking about what the greatest ever Fantasy/Dream Team would look like. No salary cap. No trades required. No bye structure to take into consideration. I went with the modern 6/8/2/6 structure – there was just too many midfielders to try and fit in! Only Data from 2003 has been taken into account as that’s when the online version of DT/AF started. Career stats before 2003 have been quoted though. Selection is based on scoring capacity, games played, longevity as a premium, and consistency of scoring. Positions are based on where they have played the majority of their career with some slight discretion taken. Emergencies were picked, and based on a rookies’ best season. No prizes for guessing who this was included for. Brendan Goddard – 2003 – Present. 289 games, Career DT average – 90.7. Before his move to the Midfield, and he became grumpy, Goddard was our first picked in the back-line year in, year out. From 2006, Goddard has played more than 20 games every year bar 2007 where he only payed seven. Take that year out and he never went under 92 points a season. Got to the dizzy heights of a 112 average in 2010. Luke Hodge – 2002 – Present. 286 Games. Career DT average 90.6. Hawthorn’s fearless leader has been ever present in our teams whether it be in the defense or his occasional holiday to the midfield. From 2006, Hodge has been fairly durable playing at least 19 games in every season bar two, in 2012 and 16′ and in those same years, never gone under 83 for an average. Averaged more than 100 in four of those years, so a genuinely elite Defender. Joel Bowden – 1996 – 2009. 265 Games, Career DT ave 87. Now we’re winding back the clock! Joel Bowden was one of the first Premium backman available, and one of the first players to show ‘pig like’ tendencies with the chippety chip down back, especially when his brother turned up to the tigers. Never went below 87.7 from DT’s inception in 2002 til his retirement in 2009. Still has relevance today as he has played in a winning final for Richmond. Corey Enright – 2001 – 2016. 332 games, Career DT average – 81. Not much to say about my mate Boris the sneaky Russian that hasn’t been said before. Hasn’t played less than 21 games since 2006 and hasn’t averaged less than 80 in that same time period. Stayed relevant until the day he called time, with an average of 88 last season. Chad Cornes – Cornes was another ‘set and forget’ defender from the previous decade and at the peak of his powers from 2004 – 2009, averaging more than 85 every season. Had some durability issues at the end of his career but gets the nod as safe pick down back for a period of six years. A pick where you used your head and not your heart. Heath Shaw – 2005 – Present. 237 games, Career Dt Ave 86.2. Headache Heath gets the nod over stalwarts like Heath Scotland, Sam Fisher and Grant Birchall. While a tad consistent from week to week, dropping his yearly average below 80 once since 2006 (a 79.6 at that) is nothing to sneeze at. Has shown maturity in the last two years and become one of the elite backman which also helps his case. Greg Broughton – 2009 – 2015. 110 games. Remember this bloke? Won many astute coaches premierships back in 2009 with his debut season average of 87.7 from 15 games. Continued good form for the next two years, but fell victim to the Evil Empire that is Ross Lyon. Thank you Greg. Dyson Heppell – 2011 – Present.106 games. With a fair chance of being a top 10 mid by the end of 2017, Heppell spent his first three seasons in defense (and in my team) and made an impact straight away. His lowest average of 83 average came in his debut year and he hasn’t looked back since. Dane Swan (C) – 2003- 2016. 258 games, Career DT Ave 105. The undisputed greatest ever DTer’. Seven years straight with 100+ average. The Original Fantasy Pig. Gets the C as if it was ever in question. Gary Ablett Jnr (V) – 2002 – Present. 288 games. Career DT Ave 97.2. The Little Master. Sweet Merciful Jesus. eight years straight of 100+ average from 2007 – 2014, it was an absolute joy to watch, as long as he was in your team. Jimmy Bartel – 2002 – 2016 – 305 games, Career DT 95.4. JimBob Bartel was elite as you could get back in 2007. 8% better than the second highest average elite. Went under a 94 average ONCE in 11 years and even helped us out in our forward and defensive lines at the end of our career good he’s just that sort of bloke. Tom Rockliff – 2009 – present. 134 games, Career DT ave 106. One of the ‘rookies’ of this team, Rocky actually started life in our forward lines, with a rather impressive average of 87 from 19 games. Is on par with Swan, but may want to improve durability if he wants to challenge as the greatest ever. Matthew Keith Boyd – 2003 – Present. 282 Games, Career DT ave 93.6. ‘Keith’ is probably one of the surprises of the midfield, but another who may just slightly fly under the radar. A picture of durability and consistency, Boyd had an almost parabolic peak between 2009 and 2013, averaging 103, 112, 116, 115 and 103. didn’t drop under a 94 ave in 10 years. Leigh Montagna – 2002 – Present. 271 games, career DT ave 94.1. ‘Joey’ is another payer who surprised me with his numbers while doing the research. While he now maintains relevancy in our backline, he was one of the Rolls-Royce midfielders in 2009 and 2010 with averages of 113 and 109 respectively. Hasn’t gone under 91 since 2009 and a very durable player on the journey. Scott Pendlebury – 2006 -Present. 236 Games, Career DT ave – 102 One of my favourite players of all time. Not bad in DT either. Has been a staple of our teams since he averaged 106 in 2010 and hasn’t looked back since. Seven straight years of averaging 100+ while playing 21+ games. Absolute Royalty. Joel Selwood – 2007 – Present. 228 games, DT career ave 101. Another who I knew was good, but not this good. 83 average in his debut year and seven years of averaging 100+ in his last eight years, all while playing at least 20 games a year. Peaked in 2011 with an average of 108.8 and still has a couple of top shelf seasons to go. Michael Barlow – 2010 – Present. 126 games, Career DT ave – 100. I literally made the ’emergency’ rule just so I can include Barlow in this team. His debut season average of 109.8 is unprecedented and may not be beaten again (Brayden Fiorini DOES NOT count). Matt Priddis – 2006 – Present. 219 Games, Career DT average – 97.8. Just like in real life, Priddis only really started to get some kudos in DT once he won a Brownlow. Excluding two games in 2006 (where he won a Sandover medal), Priddis came out and averaged 91.8 in 24 games in the 2007 season. Is unlucky to have not made the actual team as a picture of consistency and durability, but just missed out with his lack of ceiling. Joel Corey – 2000 – 2013. 276 Games, Career DT average – 85.8. The ‘C’ of ABC (Ablett, Bartel and Corey, The first rule of DT in 2008) Was one of the first considered for the team but fell out due to not quite the ceiling of others over a long period of time. Scott Thompson – 2001 – Present, 307 games, Career DT average – 90.9. Another player who is a picture of consistency and durability over a very long period . Hit an 89 average in 2006 and hasn’t gone below that ever since. Peaked in 2011 with 108.9 average. Lenny Hayes – 1999 – 2014. 297 games, Career DT 88.7. A favourite of many, it is almost impossible to hate this bloke. Was pretty handy at DT too. Peaked in 2009 and 2010 with averages of 110 and 109.7 respectively. A blue chip midfielder from the inception of DT, averging 99.5 in the first season. Sam Mitchell – 2002 – Present. 307 games, Career DT ave – 92.8. Has gone over a 90 average since 2006, including a four year streak of 100+ from 2009 – 2012. Also had a stint in defence which was prettyyyy useful. Nathan Buckley – 1993 – 2007. 280 games, Caareer DT ave – 98. Gets a mention as the highest scoring player in the inaugural season of DT in 2003(106). Was the Dane Swan of the late 90’s/early 00’s with a massive 117 average in 2000! Nigel Lappin – 1994 – 2008. 279 games, Career Dt ave 82. Gets a nod as one of the early DT guns, averaging 100, 102, 88.8 and 99.8 in the first four years of DT. Dean Cox – 2001 – 2014. 290 Games, Career DT ave 88.3. The best DT ruckman to grace our screens in my eyes. One of the first picked from 2005 – 2013. Dipped under a 90 average just once in that time. Genuine Gun. Todd Goldstein – 2008 – Present. 171 Games, Career DT ave 87.5. Like most big men, took a while to warm up to the rigours of AFL, but hasn’t looked back since 2011. A massive average of 111 in 2015 was his peak to date. Jonathon Giles – 2012 – Present. 58 games, Career DT ave 71.6. Deserves his spot thanks to his debut season in 2012 where he averaged 82 over 20 games. Was a lock at R2 in the pre-season and didn’t disappoint. NB – Turns out it is really hard for a big man to stay on the park! Durable, consistent ruckman over a long period – they don’t grow on trees! Sam Jacobs and Jeff White were probably next in line. Nick Riewoldt – 2001 – Present. 319 games, Career DT ave 93.5. One of the easiest picks of this team. Dropped below an 85 average once since 2004, going over a 100 in four of those years and above 95 in another four. Don’t pigeon-hole this bloke as an ageing key forward. Paul Chapman – 2000 – 2015. 280 – games, career DT ave 87.6. Went through a magnificent seven year period 2006 – 2012 where he played a minimum 19 games in a season and averaged at least 97 for six of those seven years (90 the other season) and an elite peak of 112 in 2009 and 10′. Steve Johnson – 2002 – Present. 275 games, Career DT ave 89.5. Stevie J has been a fantasy staple of our forward lines since 2007, going on an eight year run averaging at least 93 points a year, including a massive 116.8 in 2013. Brad Johnson – 1994 – 2010. 364 games, career DT ave 86.7. The Smilin’ Assassin was a rolled gold gun back when DT started in 2003. started off with a 99.9 average in 2003 and only dropped under 94 once in seven years. Johnno was as durable as they come, only playing less than 20 games in his first and last season respectively. Brett Deledio – 2005 – Present. 243 games, Career DT ave 89.9. Lids could almost be classified as a DT journeyman, being available as a defender, mid and forward, and not just near the twilight of his career. A Mr Fixit for his Tigers, and a similar role in our team. Nine years of at least a 89.7 average and amazing durability before 2014, playing at least 19 games since his first year. Dustin Martin 2010 – Present. 153 games, Career ave 92.9. While picked last, he’s definitely not least. There is a good chance that there are coaches that have had Dusty in their team for every game he has played. Has increased his average every year apart from one, with 107 last year. Lets hope he doesn’t stay a mid for too long. Dayne Zorko – 2012 – Present, 101 games, Career DT ave 90. If my memory serves me corrcet, Zorko came into the Brisbane side mid season and was an absolute revelation in both real life and DT. 16 games and and a 94 point average was one of the best ever from a rookie. Special mention to DT guns, Matthew Pavlich, Adam Goodes and Ryan O’Keefe who were strongly considered for the team, but just missed out. Well that was one very enjoyable article to write. It was great fun taking a trip down memory lane and get reminded of the guns of yesteryear, while also learn about other players who I wasn’t so familiar with. I must admit it was a tad hard to try and normalise all the data to be able to compare apples with apples , I’m not exactly a mathematician when it comes to these sort of numbers. It was also great to see how the game has evolved over the time from a efficient, Key forward orientated game, to a free flowing, slingshot, high possession game we see today. This has obviously shown in the rise in DT averages over the years. In 2003, the top 50 players, averaged 88.8. In 2016, that figure was 103.6. This is obviously “my” greatest team and it is a very subjective thing to talk about, but will hopefully generate some good discussion. 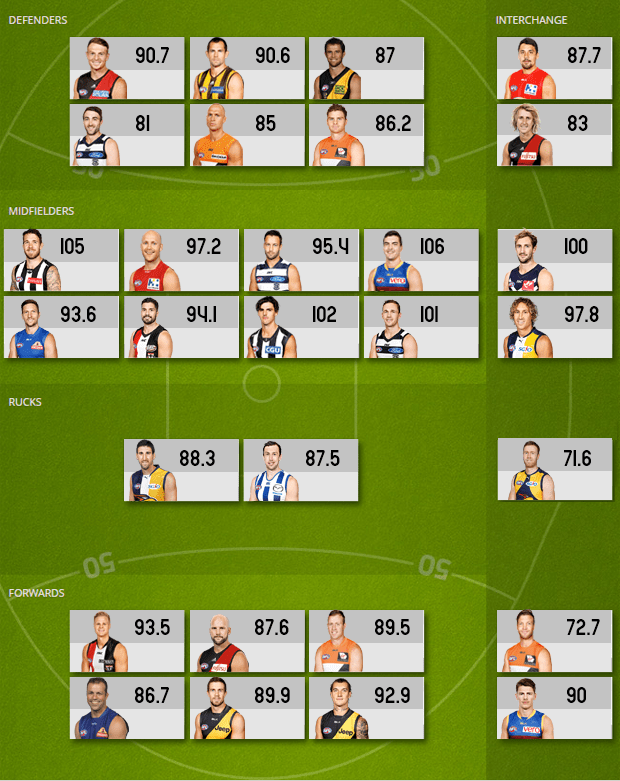 Would love to hear your thoughts on which players I missed out, which players should and shouldn’t be in my team. Hit me up on @jimbobholder on Twitter. Big thanks to Rumballz for the pics! Legend! Yeah durability was the reason he missed out. He’s been ‘a bargain’ too many years. to be fair, Carlton has had a rubbish decade and a half. Simpson and Scotland the only 2 who really deserve a look in and Judd was far better at SC. Gibbs was would of been in strong contention if he spent a bit more time in defense, but I classed him as a MID. He and Bucks were the two best mids by a margin for a while. You had to have them both, this is back in the early noughties. I’d have them above guys who were only 5th or so for their position at the time. Strange, isn’t it that team success doesn’t necessarily equate to DT success. Two of the teams that have dominated the comp for the past decade in Hawthorn and Sydney have no representation in this team. Thought Buddy might have snuck into the forward line. The core of the Cats 3 Cups is there though. Gaz, Jimmy, Selwood, Enright, Chappy, Stevie J.
Hodge is in there btw. Was obviously on drugs when i said there were no Hawthorn players. Sandi couldn’t get a gernsey at R3??? not too sure how u could pick palmer ahead of franklin and giles ahead of jacobs or even everitt. Other then that i think it is on the money. I’ll reiterate here that the emergencies picked are NOT the next best, rather the best rookie season of a player in that position. How the F*ck does Greg Broughton get in this team otherwise? Also some stats for Sandi. 5 seasons of 15 games or less unfortunately didn’t tick the durability box for me. Had a good four year patch from 09-12′ averaging 96, 95,95 and 88. His career DT average is only 77.8. Goldstein wins for me. Franklin was also very close. Was almost a flip of the coin between him and Dusty. Theres a lot of dumb people out there Jimbob. I thought it was a pretty interesting article. Cheers for that. Nice little trip down memory lane! Adam Treloar as a rookie fwd. Ave 87 from memory? ?